Blessed are you, Lord, God of all creation. Through your goodness we have this wine to offer, fruit of the vine and work of human hands. It will become our spiritual drink. RSCJ make much of the fact that Sophie grew up in a small town overlooked by vineyards, in an environment steeped in viticulture and wine-making, which are at the heart of so much scriptural and spiritual symbolism. 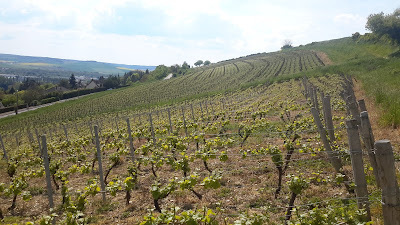 One thing that has always struck me is how low the Joigny vines are kept, their trunks cut back to only a couple of feet. I was especially conscious of their lowness when I was there earlier this month, as I stooped and squatted to take close-up photos. The top wires around which the vines will train barely reached my hips, and the supporting wooden posts were only a few inches higher. 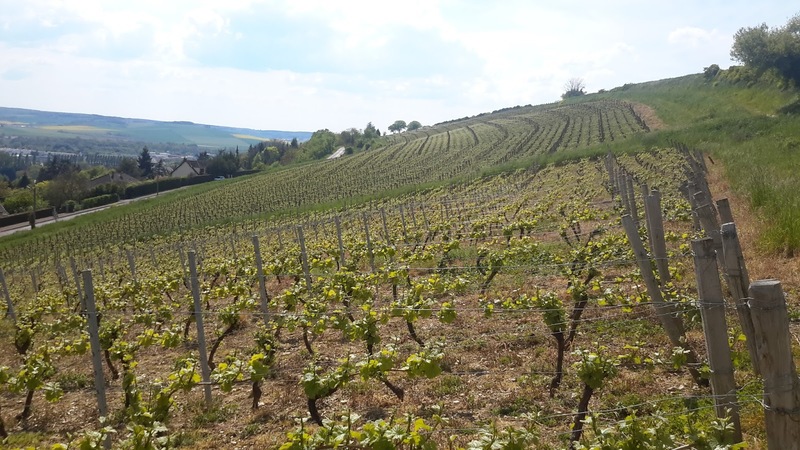 The Joigny RSCJ community told me this is the traditional method in Burgundy, and vines are higher elsewhere in France - as indeed they are in northern Italy, the grape-growing region I know best. Grape picking is hard work - but at least with a taller vine the grapes are at a convenient height! The same goes for pruning and general vine management: the lower the vine, the more bending is needed, the more back-breaking the work. Sophie would have known this only too well: at harvests she'd have known what it meant to bend and stoop and crawl for hours, to be sore and aching, hot and sweaty, with clothes and hands purple and sticky with grape juice. But she'd have also known the camaraderie and common purpose of a close-knit group working together and, at the end, the blessed relief of accomplishment and hard work well done. Like bread, its Eucharistic counterpart, wine has always been very much the work of human hands. Both bread and wine require time, effort, patience, skill and hard work: sowing or planting, waiting, months of cultivation, harvesting and then the lengthy process of transforming grain and grape into bread and wine. Even now, in an age dominated by machinery, human labour is still an essential part of this transformation of that which earth has given and the fruit of the vine into the bread and wine brought to our altars at every Mass, to be transformed into Eucharist through the powerful action of God. In this feast of Corpus Christi, as we celebrate this tremendous gift and the abundant love of the Giver, we can also give thanks for the hard work and sweat of all those human hands which, often unknowingly, have contributed to Christ's Real Presence in and among us. And we can give thanks, too, for a God who calls and wants us to play our part, however insignificant and unconsciously done, in bringing his strengthening, nourishing presence into our world. Give them something to eat yourselves says Jesus to his disciples in today's Gospel, and he continues to say this to us, every day. Whether with our hands or our hearts, labouring and aching or otherwise, we too can share in this mission to which we are all called.